It is that time of year when parents and children are crossing off all of the school items required by their teachers. I came across this guide, CHEJ PVC-Vree School Supplies provided by the Center for Health, Environment & Justice. It has a list of items to consider when purchasing school supplies. I have to say, I would not have given much thought to some of the items mentioned. It is a publication to certainly look at and print out when looking for school supplies. Here are some of the items mentioned. Stick to the plain metal paperclips. 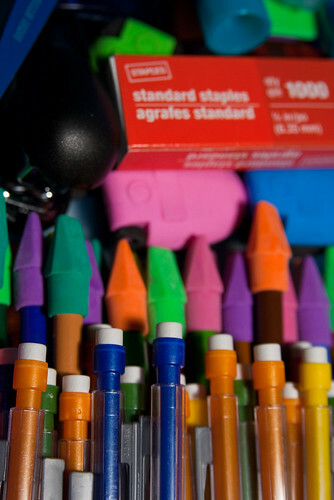 Colored paper clips are often coated with PVC. Studies have found vinyl raincoats are often loaded with toxic phthalates. The guide also provides a directory of companies that offer PVC-free school supplies. It is quite extensive and informative. Another suggestion, I would make is to think of supplies that kids may want to put in their mouth, like a pen or a pencil. Typically, toxins make it into our body’s through direct contact with the mouth being the most susceptible and direct way for these toxins to enter.